Most people today, I dare say, do not think of a 'drone' as being anything like the ones presented in this article. In fact, I doubt they even think of the military versions (Reaper, Predator, Global Hawk, et al) that a decade ago were for taking out Taliban leaders as they rode in their U.S.-made, air-conditioned Humvees across the desert lands of Afghanistan. Nowadays if you mention a drone, most likely the layman will conjure up visions of a tiny quadcopter with electric motors being piloted by some overweight guy donning baggy pants and a backwards-worn baseball cap. They remember headlines of neighbors spying on neighbors with camera-equipped R/C vehicles, commercial aircraft being diverted during landing due to 'drones' in the flight path, and restaurant patrons getting clipped by quadcopters being used inside to deliver messages. As with so many other terms, the language has changed considerably to the extent that heretofore commonly used and understood words have taken on a completely new definition; to wit: tweet, spam, bandwidth, troll, hanging, bad, tool, cell, etc. Much military money is going into the design, development and production of drone aircraft. These are not the full-size surplus airplanes modified for remote control operations we've seen being knocked out of the skies during movie and TV programs, but rather overgrown model airplanes devised for particular missions. They are powered by small piston engines for low altitude and low speed work, turboprop powerplants for increased altitudes and speeds, and rocket and turbojets for extreme speeds and altitudes. 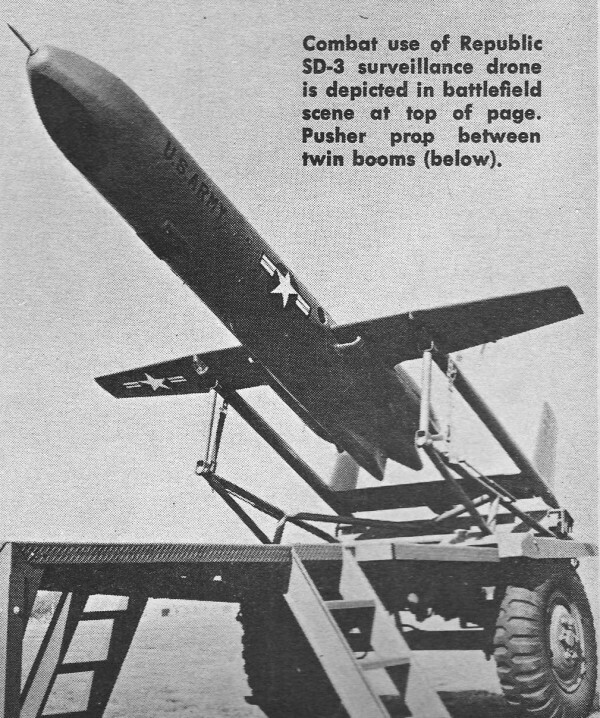 Spying or Surveillance Drones, launched and then guided over enemy territory, are fitted with TV "cameras, movie cameras and other electronics gear to report back a mass of pertinent information to field commanders - thus supplementing the use of time-consuming combat patrols (and quite possibly" saving the lives of many pilots). Target Drones, both reusable and expendable types, are employed as surface-to-air and air-to-air anti-aircraft cannon and missile targets. Although high-speed tow-targets have been developed, there's always the possibility of a tow plane becoming the mistaken target - with" the drone there is no such worry. Also, the drone may be put through intricate maneuvers, thereby more closely resembling an attacking aircraft. They are equipped with burst-distance indicators for scoring, some accurately measuring the separation between target and missile in flight from 10 to 3000' out, thus recording theoretical hits or near misses and pass angles of the interceptor missiles. Some drones are fitted with a radar target augmentation device which enables the drone to portray a wide variety of planes and missiles by casting a beam "shadow" to increase its size. 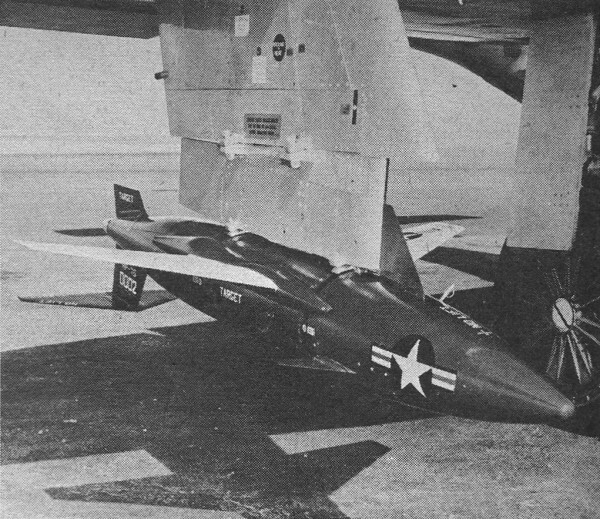 Radioplane's XQ-4 is high speed missile target. Radioplane is a division of Northrop. Aerial camera goes in SD-1, drone and camera remotely controlled. 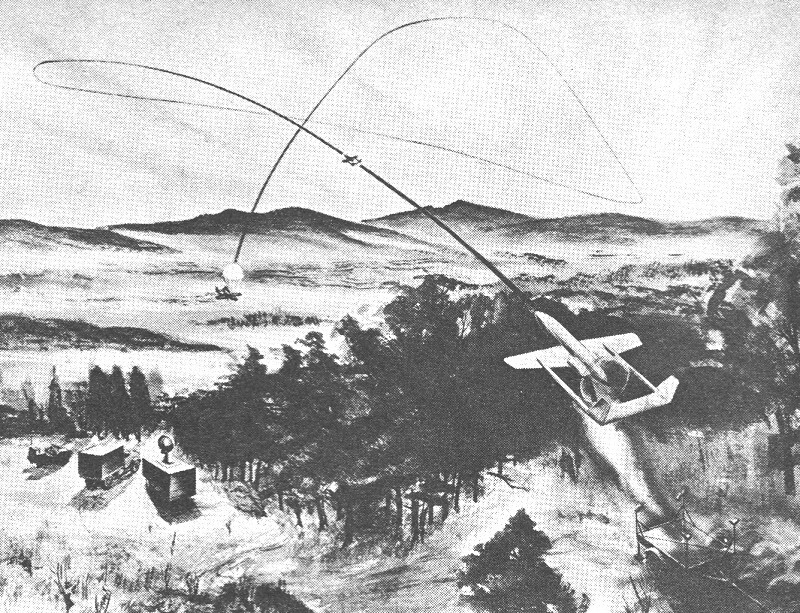 Combat use of Republic SD-3 surveillance drone is depicted in battlefield scene at top of page. Pusher prop between twin booms. Ground-launched drones require no airports for launching or recovery; they use zero-length launchers and catapults which may be set up on any road or small clearing, or are fired directly from their transport trailer. Air-launched drones are carried aloft on pylons mounted under the wings of a mother-plane. As with all military projects, security shrouds a good portion of development and performance. The accompanying directory covers only those projects announced and the data released on them. However, other aircraft concerns and missile system developers are known to be active in the drone business. 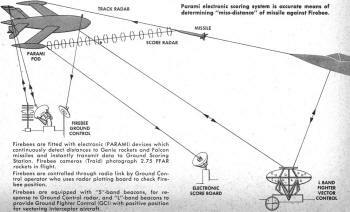 Firebees are fitted with electronic (PARAMI) devices which continuously detect distances to Genie rockets and Falcon missiles and instantly transmit data to Ground Scoring Station. Firebee cameras (Traid) photograph 2.75 FFAR rockets in flight. Firebees are controlled through radio link by Ground Control operator who uses radar plotting board to check Firebee position. Firebees are equipped with "S"-band beacons, for response to Ground Control radar, and "L"-band beacons to provide Ground Fighter Control (GCI) with positive position for vectoring interceptor aircraft. Beech 1001-Navy XKDB-1. Span 12'10"; 15' long; 3'3" height; 18" diameter; McCulloch Turbosupertharged 0-150-4 120 hp powerplant; 320 mph speed; 43,500' ceiling; 60 min. (plus) endurance; ground or air launch; single-stage reefed parachute recovery. Surface-to-air or air-to-air armament systems training. Gross weight up to 600 lbs. First production contract $8,700,000. Set unofficial Navy altitude record in KD-300 (medium performance) class. Has "V" tail. Beech 1013. Span 12'; 13 1/2' long; 18" dia; McCulloch 0-150 120/130 hp powerplant; 275-320 mph; 30,000' ceiling; 75 to 120 min. endurance; ground or air launch; single-stage reefed parachute recovery. Reconnaissance/Surveillance. Gross weight up to 800 lbs. Carries cameras or TV - an adaptation of Model 1001. "V" tail. Bendix. Surface-to-air or air-to-air aerial weapon systems training. Private venture, low-cost target drone, program controlled with radio override If necessary. Carries radar and Infrared augmentation to simulate much larger target. Can operate at all required altitudes, speed and ranges. Fitted with electronic scoring device for miss distance indication. Bendix-Bell "Penny-IC." 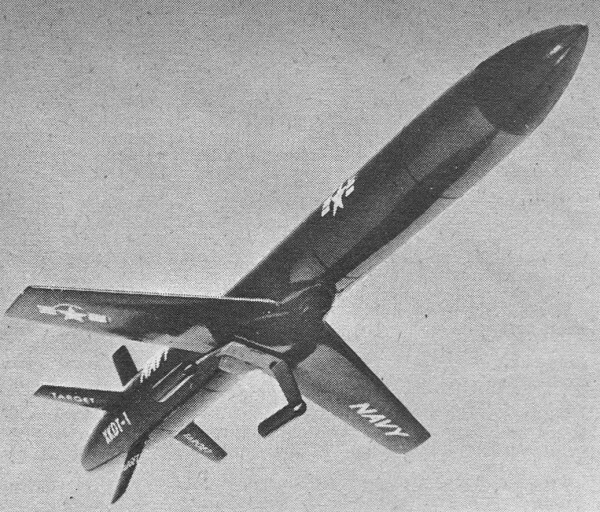 Span 64"; 20' long; 13" dia; dual-chamber liquid rocket engine; air-launched; high-altitude, supersonic, low-cost expendable target; gross wt 950 lbs. Bendix-Republic "Hilo." 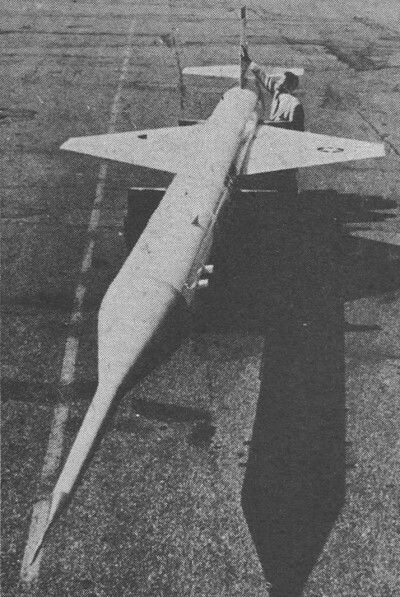 Span 38"; 21 1/2' long; 14" dia; 14" Marquardt ramjet; ground-launched by boosters; for transonic low-altitude or supersonic high-altitude operation; gross wt 778 lbs. 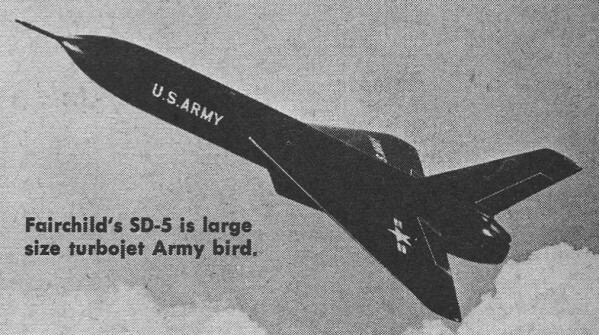 Fairchild-Army SD-5. Pratt & Whitney JT-12 3000 lb thrust turbojet power-plant. Surveillance. Delta wing configuration. $48,000,000 order for development, manufacture and testing of undisclosed number of surveillance systems and drones. 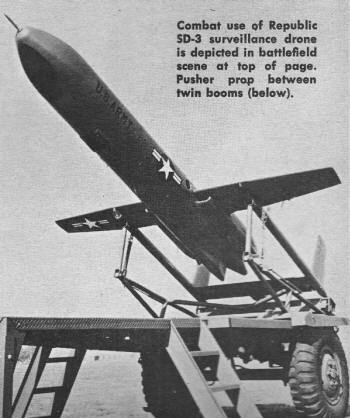 A high-speed, rather large drone. Lockheed "Kingfisher"-Army XQ-5. -Span 10'; 38' long; 20" dia; Marquardt ramjet powerplant; supersonic; air launch; parachute/nose spike recovery. Target missile. Mach 2 plus. Gross weight over 7600 lbs. First contract $7,500,000. Radar "lens" projects enlarged phantom image. Radioplane-Army OQ-19B & D. Span 11 1/2'; 12 1/4' long; 2'7" ht; McCulloch 0-100-1 72 hp powerplant; 228 mph; 23,000' ceiling; 90 min. endurance; ground launch; single-stage parachute recovery. Surface-to-air missile and gunnery trainer. All metal construction. 25,000 delivered to date. Guidance by remotely controlled autopilot. Temco's XKDT-1 is rocket powered, flys near Mach 1. RP-76 is Radioplane's radio controlled rocket job. RP-77D set altitude record of 46,000' for turbo-prop drones. 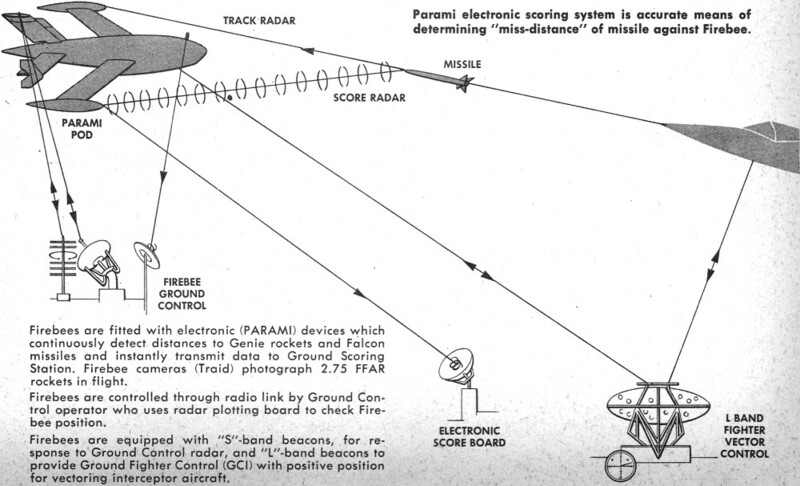 Parami electronic scoring system is accurate means of determining "miss-distance" of missile against Firebee. OQ-19 floats back to earth by parachute after target use. "Enemy" attacker is electronically portrayed by XQ-5. 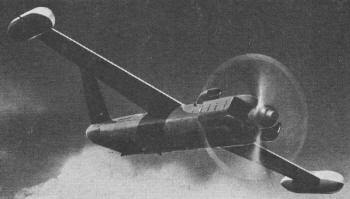 Beechcraft XKDB-1 target drone for the Navy is shown above and below. One of the earliest drones, Navy TDD-4 built by Denny (of Dennymite model engine fame). See Saga of the OQ-2A Drone. Radioplane RP-71F-Army SD-1. Span 13'2"; 13'1" long; 2'7" ht. ; McCulloch 0-100-2 72 hp powerplant; 184 mph; 15,000' ceiling; 45 min. endurance; ground launch; single-stage parachute recovery. Surveillance. All metal construction. Carries photo, TV or sensory equipment. Guidance by controlled autopilot. 20 under evaluation. Radioplane RP-76. Span 5'; 9'8" long; 1'4" ht; Aerojet-General 530NS-35 solid propellant rocket powerplant; Mach 0.9; 50,000' ceiling; 8 to 10 min. endurance; air launch; 2·stage ringsail parachute recovery. Target missile for surface-to-air missile training. Undisclosed evaluation production number. lnverted T-tail. Burst hit Indicator relays info to ground. Radioplane Rp-77D. Span 15'; 14 3/4' long; 5'2" ht: Boeing 502-10 free turbine powerplant; 420 mph; 47,000' ceiling; 90 min. 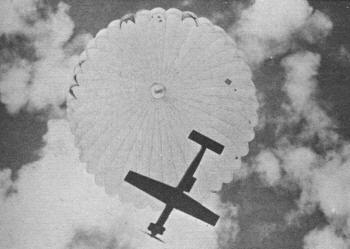 endurance; ground or air launch; 2-stage ringsail parachute recovery. Target for surface-to-air and air-to-air gunnery, rocketry and missile firing, weapon testing and evaluation. Fuselage almost entirely fiberglass construction. Radio controlled autopilot with heading for guidance. Evaluation quantity in production. Set unofficial altitude climb to 46,000 ft. Surveillance version also under development. Radioplane-USAF XQ-4. Span 12'; 35' long; 5'7" ht; Westinghouse XJ81-WE-3 turbojet powerplant; supersonic speed; 60,000' plus ceiling; air launch; 3·stage parachute with locating beacon recovery. Powerplant is carried underslung; long, small diameter fuselage, straight wings. XQ-4 and XQ-4A are under tri-service military program for radar appearance compatibility with Bomarc-Sage air defense system and as high speed target for Terrier, Genie, Talos, Sidewinder, Sparrow III, Falcon, Nlke-Hercules and Hawk missiles. 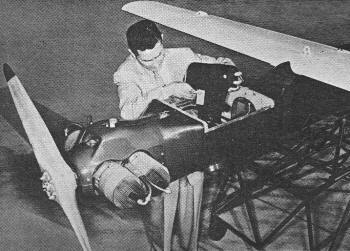 XQ-4B under development; engine is G.E. J-85. 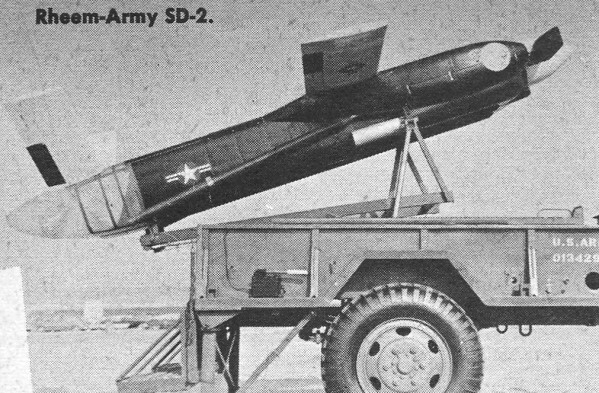 Republic "Snooper"-Army SD-3. Span 11'; 15' long; Continental 140 hp powerplant; ground launch; parachute recovery. Surveillance with interchangeable radar, photo, TV and infra-red detection noses. Low speed all-weather type with pusher propeller. Uses "Arrow" IIE rocket boosters for launching. Weight is under 1000 lbs. Republic "Swallow"-Army SD-4. Span 11'; Pratt & Whitney JT-12 3000 lb thrust turbojet powerplant; ground-vertical launch; parachute recovery. Surveillance with interchangeable radar, photo, TV and infra-red detection noses. Delta-wing configuration. $25,000,000 development contract. Uses rocket boosts for launching. Rheem-Army SD-2. Lycoming M0-360-ALA 180 hp powerplant; parachute recovery. Surveillance. Fiberglass construction throughout. Launched from Army trailer with Grand Central "Arrow" IIE rocket boosters. Has "V" tail. Ryan "Firebee"-USAF·Army Q-2A. Span 11'2"; 171/4' long; 5'10" ht; Continental J-69-T-19B turbojet 1060 lbs thrust powerplant; 600 mph; 50,000' ceiling; 60 min. (plus) endurance; air or ground launch; 2-stage parachute recovery. Target drone for surface-to-air and air-to-air missiles. Wing tip pods carry electronic scoring equipment and Triad cameras. Over 1500 missions have been flown by USAF, Army, Navy and RCAF "Firebees," some making as many as 19 missions. Others have flown for 25 minutes after receiving hits which severely damaged airframe and powerplant. Ryan-Navy KDA-4. 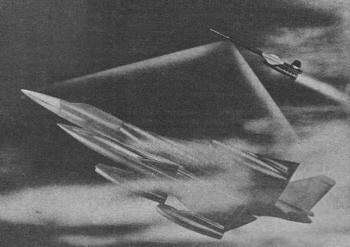 Span 11'2"; 17'3" long; 5'10" ht; Fairchild J-44-R-20 turbojet 1000 lbs thrust powerplant; 600 mph speed; 50,000' ceiling; 60 min. (plus) endurance; air or ground launch; 2-stage parachute recovery. Target drone for surface-to-air and air-to-air missiles. Ryan-USAF XQ-2C. Span 12 3/4'; 22 3/4' long; Continental J-69-T-29 1700 lbs thrust powerplant; 600 mph (plus) speed; 50,000' ceiling; 60 min. (plus) endurance; air launch; 2-stage parachute recovery. Target drone for surface-to-air and air-to-air missiles. Q-2C improved version of the "Firebee" with pointed nose to internally house radar augmentors and electronic gear. Temco "Teal"-Navy XKDT-1. Span 4'11"; 11'10" long; 1' 11 1/2" ht; 10" dia; Astrodyne dual-thrust solid propellant rocket-boost thrust, 150 lbs/4 sec; sustained thrust, 50 lbs/506 sec; Mach 0.95; 55,000' ceiling; 8 1/2 min. endurance; air launch; self-destruction in 9 min or if target heading carries over 10 degrees. Missile target. 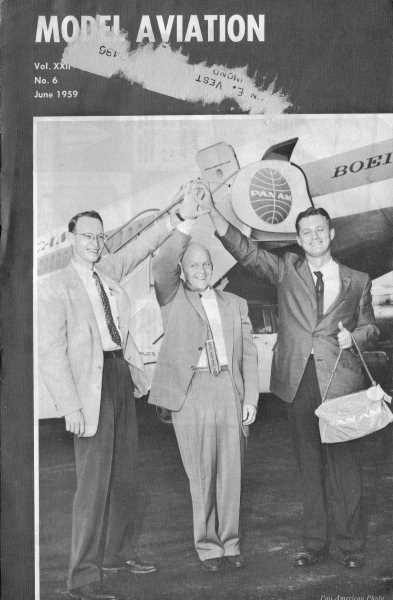 Fuselage construction of fiberglass and magnesium; wings are aluminum honeycomb sandwich; control surfaces magnesium. Gross wt 350 lbs. Guidance by 3-axis autopilot, First successful rocket powered target; first controlled launch from a sweptwing fighter; first flight of a solid rocket motor with 8 1/2 min. endurance. Temco 60B. Design study - extending both velocity and altitude capabilities of "Teal." Temco 66B. Design study - "Teal" development with ground-launch capabilities using rocket boosters. Advanced version of Ryan Q-2A Firebee is Q-2C. Fairchild's SD-5 is large size turbojet Army bird.